2014 is a very exciting year in our household and more specifically in our 2nd grader’s life. She will be receiving her first Holy Communion in the Spring. 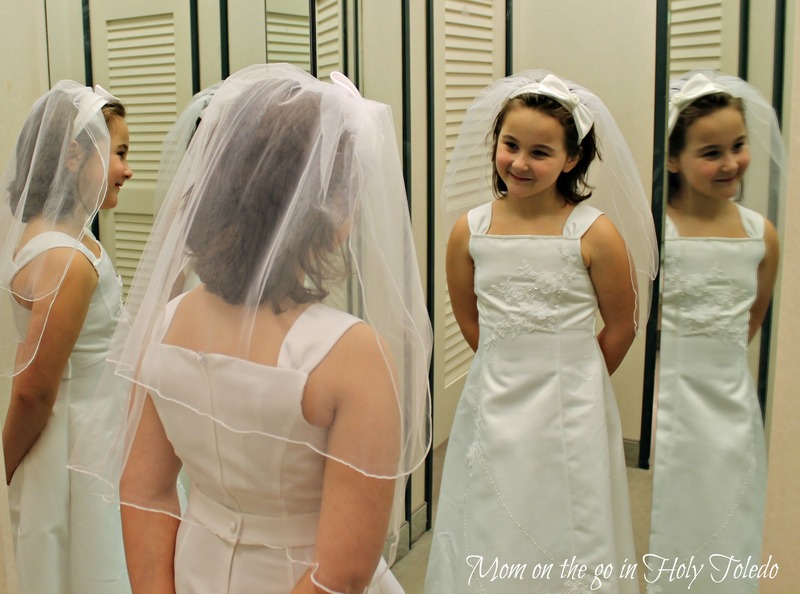 Why is the First Holy Communion so sacred? As she expressed, “it is the most special gift in the world, Jesus will be entering my heart”. I tell you most solemnly, if you do not eat the flesh of the Son of Man and drink His blood, you will not have life in you. Anyone who does eat my flesh and drink my blood has eternal life, and I shall raise him up on the last day. For my flesh is real food and my blood is real drink. He who eats my flesh and drinks my blood lives in me and I live in him. As I, who am sent by the living Father, myself draw life from the Father, so whoever eats me will draw life from me. This is the bread that came down from heaven; not like the bread that your ancestors ate; they are dead, but anyone who eats this bread will live forever” (John 6:48-58). 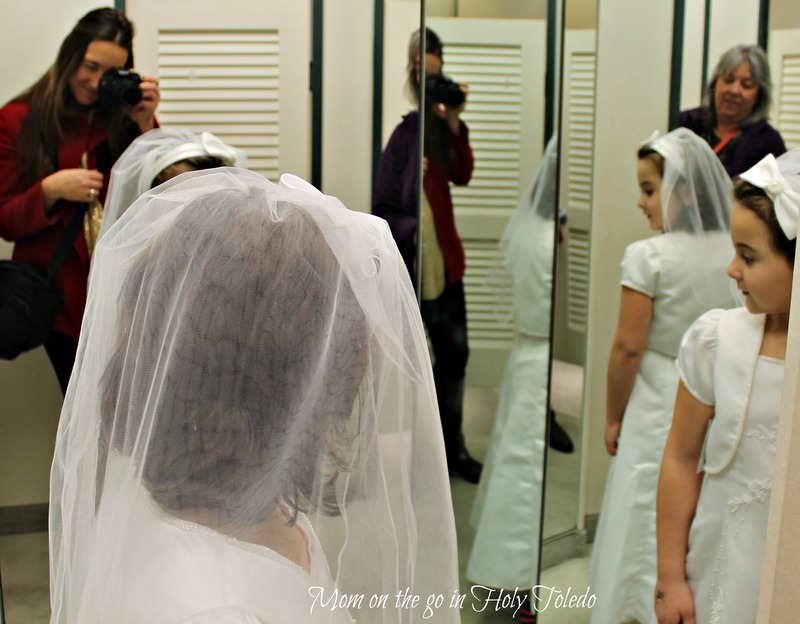 In preparation for the BIG day her Godmother offered to purchase her dress and veil. 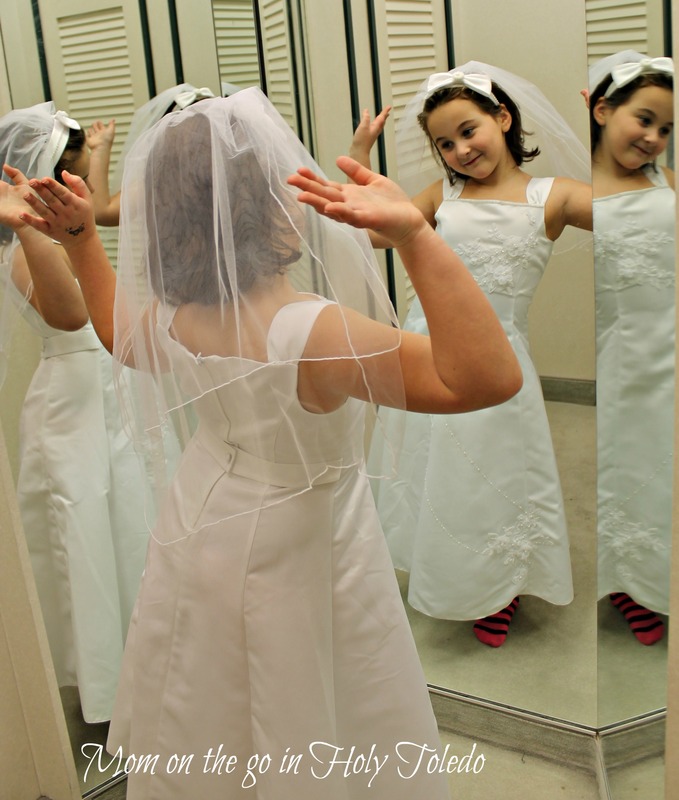 Which is a huge gift in itself but what was even better was the experience of going shopping for the gown and veil. 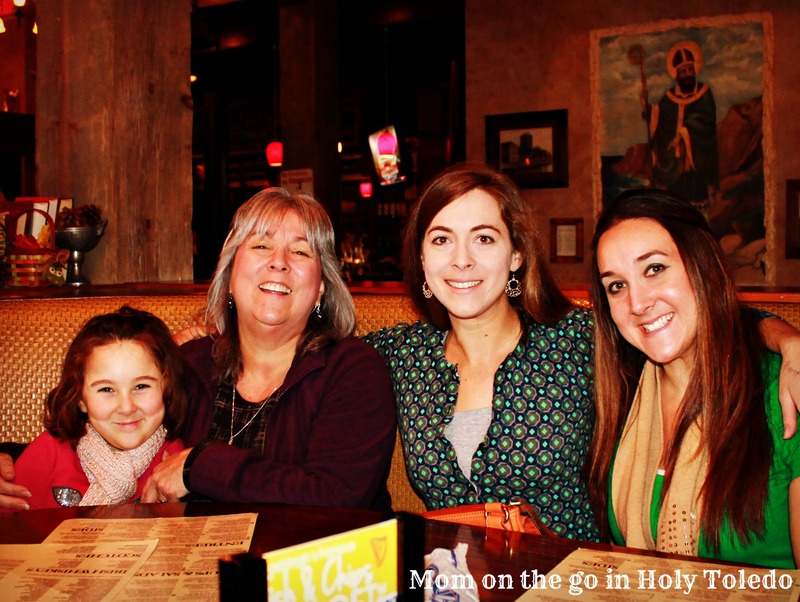 I could feel the presence of the Holy Spirit when my mother, sister (her Godmother), my daughter, and I spent the day together. The only thing that could have added to the experience was if my grandmother was with us. To have 4 generations together would have been amazing but I find comfort in knowing that she was with us in spirit. Her eyes lit up when she walked into the fitting room and put on the first dress. Meanwhile my eyes started to tear up a little. It felt like just yesterday I was carefully removing her baptismal gown and now here I was helping her try on First Communion dresses. Where does the time go? She has been preparing for this day for quite some time. She attends her catechism classes, Mass on Sundays, and the occasional daily Mass, we discuss the virtues and Saints in our Little Flower Girls’ Club but beyond that she has had an interest in the bible, the life of Jesus, and longing to grow closer to God. Which, if I am being 100% honest I have my mother to thank, and her mother, and all the past mothers in our lineage who have made faith a priority. It seems like with each generation the secular world has grown and infiltrated the home and family more and more. The invention of the telephone, television, computer, cell phones, iPads, etc. has brought on new challenges for families and at times temptations. Each generation has had to learn the importance of moderation and work though temptation. And my generation is no exception. It was such a magical day. I wish every mother could experience what I did that day. I know there are many people out there looking for something but they don’t know what it is…something to fill their hearts with joy. And they think they will find it in a fulfilling job, in a fun hobby, maybe in the way other’s make them feel, but they wont. That joy, that security, that peace, is found in faith. If it feels like their is something missing in your life look to your faith. Stop making excuses. I understand it is difficult to get to church, trust me I understand. You have had a busy week and the last thing you want to do is go to church in the morning. I know how much work it is because I do it. I get my kiddos ready, park the car, trail through the snow in freezing cold temperatures, drop off the younger 2 at the Good Shepherds program, head back out into the cold over to the church, and then attend Mass with my 2nd grader. I do all that solo at least 52 times a year (not counting other days of obligation) And there are some mornings when I am literally in tears because I know that I have to be the one in charge again, I have to get everyone going again, morning 7! And I am tired, cold, and worn but once I get to church and hear God’s words, words that seem to have been spoken/ written specifically for me, my life, my current struggle, I am refreshed and ready for a new week. It is the getting there that the devil tempts me. He tempts me by focusing my attention on what isn’t important, what others are doing with their time. Why should I have to go to church when others are not? I worked hard all week too, why should they relax when I have to keep going? Then I am reminded of all Jesus gave for me. The fact that God has entrusted me with 3 little souls to nurture and guide, that isn’t something to be taken lightly. I don’t go to church for me. I don’t go to church for my children. I go to church because I do everything I do for the glory of the one who made me (totally a line from the Steven Curtis Chapman song) and he knows what’s best for me and my family and that means going to church. Parents, making certain your child has a relationship with God has never been more difficult and yet more necessary than now. Please make the effort. You are stronger than you know. Do you find it difficult to make it to church? What is holding you back? Or do you go religiously (no pun intended) and if so what motivates you?